Aladdin is a crowd-pleaser. 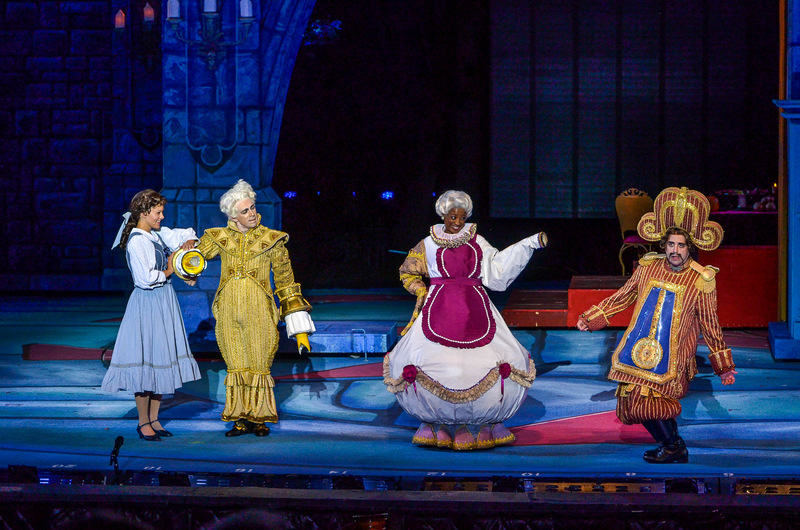 There’s no question about that when you attend the touring production at the Fox and hear the enthusiastic audience reactions to this adaptation of the popular Disney animated movie. It’s got a memorable score and some classic songs, as well as big, bright, flashy production values and an excellent cast. 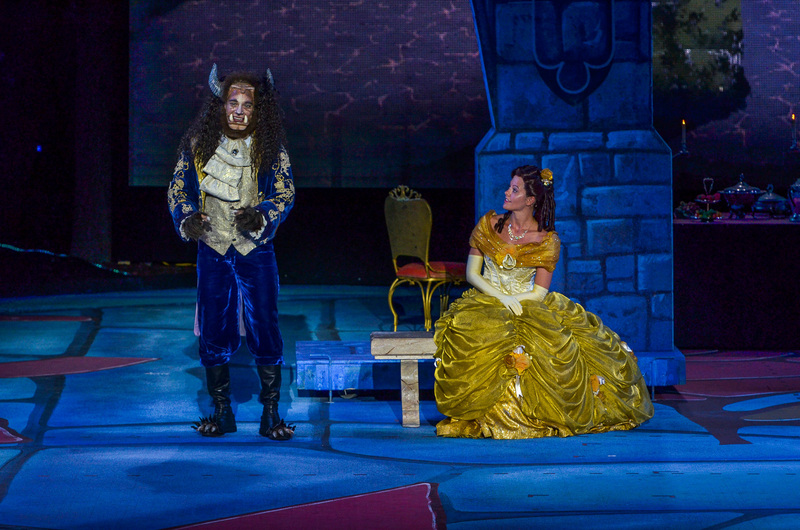 There’s a lot to enjoy about this production, although there are also some problems. The show, as presented at the Fox and based on the Broadway production, is essentially like a Disney theme park attraction on stage. It’s not particularly authentic to the Middle Eastern setting–in fact, the Genie (Michael James Scott) makes a point in his introduction of telling the audience that this is a fictional location, and especially stressing the word “fictional”. The cast is very diverse, but the show is definitely not going for accuracy in terms of setting and tone, either. It’s all extremely stylized and played up for humor. The film was also highly stylized, so this is just following that precedent, although this stage version is even more so, somewhat in the vein of a 1950s-style sketch comedy show. The hit songs from the film are all here, from “Friend Like Me” to “A Whole New World” and more. The story is essentially the same as the film, but with some changes—Aladdin (Clinton Greenspan) now has three sidekick-friends–Babkak (Zach Bencal), Omar (Phillippe Arroyo), and Kassim (Jed Feder) who show up from time to time, and villain Jafar (Jonathan Weir) still has his henchman Iago (Jay Paranada), but Iago is not a parrot and the other animal characters from the film have been written out. Princess Jasmine (Lissa deGuzman) is given a little bit more to do and sing. Also, Aladdin is given a little more backstory and some plot points have been changed and rearranged, and the ending seems somewhat abrupt. I first saw the stage adaptation of this show a few years ago when the Muny presented it, prior to its Broadway run. It was still in the development stages. Seeing it again at the Fox, I’ve noticed a lot of changes made to the script in the meantime, some of which are improvements and others that are more questionable. For instance, Aladdin’s three friends were the narrators in the Muny version, and seemed more of a presence in the story. Here, the narrator role has been given to the Genie, which seems appropriate in one sense since the Genie is such a memorable character. Still, the three friends now seem more like thrown-in characters and don’t seem to have a lot of purpose in the story. Still, this isn’t trying to be deep or challenging. It’s trying to be a big Disney spectacle, and it succeeds at that, for the most part. It’s big, it’s flashy, there’s an impressive, ornate, versatile set by Bob Crowley, whimsically stylish costumes by Gregg Barnes, and atmospheric lighting by Natasha Katz. It almost looks like an animated film come to life, and director-choreographer Casey Nicholaw’s choreography is energetic and well-performed. It’s the performances, in fact, that are the real highlight of this production, led by Scott in a funny, high-energy, charismatic turn as the Genie. Actually, with this show it’s worth wondering why they don’t just retitle it Aladdin and the Genie or even the other way around because even though Aladdin has the most stage time, the Genie is really the star. Greenspan is an amiable Aladdin as well, with a strong voice and excellent chemistry with the equally strong deGuzman as Jasmine. Their duet on “A Whole New World” is a highlight, as is the staging of that song, which is a major improvement on the version I saw at the Muny. Weir and Paranada are also excellent, hamming it up with enthusiasm as a pair of over-the-top cartoon villains. Bencal, Arroyo, and Feder do well with their underwritten roles, as does Jerald Vincent as the Sultan. The leads are supported by a strong ensemble that does well with the high-energy dancing and production numbers, as well. There’s more than a little bit of the commercial about this Aladdin, but that’s not a surprise, really.It has a great cast and memorable songs. It’s a bright, tuneful, energetic show that’s sure to attract a large family audience, and if that’s what you are looking for, you should enjoy it. It’s a musical based on the story from a well-known opera, with music by one of pop music’s most recognizable names. It’s set in ancient Egypt, but with a host of modern musical styles from pop to rock to gospel and more. The show is Aida, and it’s the last–and best–production of the Muny’s 98th season in Forest Park. Aida is named after its central character, a Nubian princess (Michelle Williams) who has been captured along with others from her country as a result of a recent battle with Egypt. The Nubian captives are taken as slaves by the Egyptians, and Aida keeps her identity as a princess secret. The Egyptian captain, Radames (Zak Resnick), decides to present Aida as a “gift” to be a handmaiden for his betrothed, Pharaoh’s daughter Amneris (Taylor Louderman), although he and Aida are obviously attracted to one another. As their attraction grows, political intrigue also grows, as Radames’s unscrupulous father Zoser (Patrick Cassidy) schemes to get his son into power, against Radames’s own wishes. As the story continues, Aida and Radames are increasingly drawn to one another as Aida also develops something of a friendship with Amneris and also confides her secret to her countryman, Mereb (Wonza Johnson), another captured palace servant who wants to reveal her secret to his people. The warlike nature of society, the injustice of slavery and imperialism, roles and expectations of women, social pressures of marriage for political gain vs. love, and other issues are key elements in this story. It’s a love story ultimately, but not only about romantic love. It’s also about love for family, friends, country, and the desire for freedom to live and love as one chooses. The excellent songs by Elton John and Tim Rice portrays these themes with style and a variety of musical styles, ranging from pop to rock to gospel. The cast here features several performers who have been involved in productions of Aida on Broadway, on tour, and in the last Muny production in 2006, including the excellent Michelle Williams, who previously played the title role on Broadway. She’s in excellent voice here and displays great stage presence and chemistry with Resnick’s conflicted Radames. Their duets are a highlight of the production. Taylor Louderman is also impressive as the initially superficial-seeming Amneris, whose ode to fashion “My Strongest Suit” is a musical and comedic tour de force. Louderman also does a great job portraying her character’s conflict and growth as a character. Also excellent is Johnson as Mereb, with a strong voice and a strong sense of conviction and loyalty to Aida and his people. There’s also a great performance by the Muny’s veteran Ken Page, reprising his 2006 role as Aida’s father, Nubian king Amonasro. Patrick Cassidy, who has previously played Radames on Broadway and on tour, does a fine job here in the somewhat cartoonish role of Zoser, although the vocals seem to be challenging for his range at times. The show also boasts a top notch ensemble, shining vocally and physically in stunning production numbers such as the Act 1 finale, “The Gods Love Nubia”. It’s a wonderful cast all around, telling the story with energy, emotion, and superb skill. Technically, this production is also a stunner. The expansive, versatile set by Tim Mackabee evokes the Egyptian setting well, with pyramids, desert backdrops, and regal palace settings. Robin L. McGee’s costumes are superbly detailed, as well, suiting the characters well and evoking the time and place. There’s also fantastic lighting by Nathan W. Scheuer and video design by Matthew Young, transporting the audience to a somewhat stylized version of ancient Egypt. Overall, this has been a good year for the Muny. Unfortunately I didn’t get to see all of the shows this year, missing Fiddler On the Roof because I was out of town that week. Still, the Muny is in excellent hands with Executive Producer and Artistic Director Mike Isaacson, and this production of Aida closes out the season in spectacular fashion. It’s a poignant, musically impressive, visually stunning, superbly acted production. I hadn’t seen this musical, or the opera on which it is based, before, and I’m glad this first-rate production was my introduction to this story. The Muny is presenting Aida in Forest Park until August 14, 2016.